Study rooms and spaces are available on Levels 1, 2R and 3 of the Library. They vary in size, capacity, scheduling, and equipment. 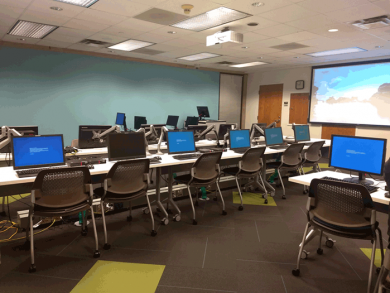 The Computer Classroom supports Duke University Medical Center's educational and training programs utilizing computer technology. It is available for formal computer-based classes, hands on training, lectures utilizing multimedia, technology-based demonstrations, and special technology fairs or exhibits. The Classroom is equipped with 15 workstations, 1 Instructor station, and a mounted projector. It is located in Room 104D on Level 1 of the Library. The Classroom can be reserved Monday-Friday from 8a-5p and must be booked at least 24 hours in advance. If you need to use the Classroom at other times, please contact Deshane Watson. Please check the Classroom Schedule to see if your date is available. Once you make your reservation, you will be asked to provide additional information about your event. Requests for scheduling the classroom will be processed and approved Monday through Friday, 8a - 5p. When the room is not scheduled for a class, it is available for general use from 8a-5p, Mon-Fri. The schedule is subject to last minute changes. 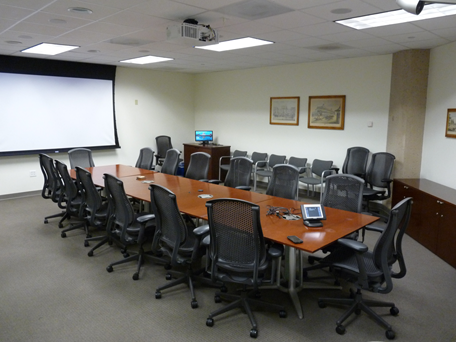 The Library has a conference room that can be scheduled for non-Library meetings. To reserve the room, call Library Administration at 919.660.1150. When the room is not scheduled for a meeting, groups may use the room on a first-come, first-served basis. Please refer to the calendar posted next to the door. Features: Internet connections, conference call capabilities, and computer projection equipment. You may plug in a laptop or use the computer in the room. Capacity: Conference table seats 14 people with another 14 chairs along the wall. Stacking chairs are also available providing a total capacity of 30-36 people. Groups need to notify Library Administration if food is to be served and allow extra time for set up and clean up. Those scheduling the room are responsible for removing all the items after the meeting. Additional guidelines about the use of the room are sent out when the schedule is confirmed. For more information, call 919.660.1150 or 919.660.1196. 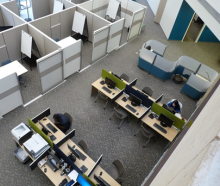 These group study rooms may be reserved by faculty, staff, and students for 2 hour blocks per individual or group. Rooms may be scheduled for up to 1 week in advance (including the day of the reservation). Availability is based on booking with preference given to those with reservations. After a 15-minute grace period for arrival, the space becomes available to others. We reserve the right to move any unattended personal items to lost and found, which is located at the Library’s Service Desk on Level 2R. For security purposes, take personal belongings with you when you leave the room for more than 15 minutes. The Medical Library Computer Classroom is available for reservation by Duke faculty and staff and DUMC students who wish to conduct a class utilizing computer technology and/or hands on training. The Classroom can be reserved from Monday-Friday from 8a-5p and must be booked at least 24 hours in advance. If you need to use the Classroom at other times, please contact Deshane Watson. A $25 cancellation fee will be charged if the Library is not notified of a cancellation at least 48 hours in advance of the scheduled event. We reserve the right to move any unattended personal items to lost and found, which is located at the Library’s Service Desk on Level 2R. Note: From August 1st through mid-September, the Classroom may be booked no more than 2 weeks in advance of the proposed event. At other times, events may be scheduled up to 6 months in advance, but reservations are guaranteed only for the 3 months prior to the event. Events scheduled more than 3 months in advance may be subject to change. Can only be scheduled for meetings by Library staff. See http://spaces.mclibrary.duke.edu for rooms that are available for booking. This space may be scheduled for faculty events by contacting Faculty Center Management at 919.684.9026. The Faculty Center was created to serve as a hub for Duke Medicine faculty interaction and an incubator for research and clinical collaborations. It is conveniently located adjacent to the Library in the Mudd building, with 24-hour access through the entrance just off the walkway along the Mudd building and from inside the Library during normal library hours. In addition to providing informal meeting spaces for faculty, coffee and refreshments are available. Access is by Duke card/badge for those with regular faculty rank. If your badge does not work, please contact your business manager.